In the airline industry risk management is a top priority. Accident prevention focuses on physical and mechanical hazards, as well as security and safety. The goal of airline risk management is to identify areas of high risk before an accident occurs. Once identified, the experts make changes to keep passengers and crew safe. It’s all behind the scenes, of course. We could be flying to Minneapolis and we’ll never know about the accident that didn’t happen because of a successful risk management policy. That’s exactly the way it should be. Most farm owners don’t have a written risk management policy, but we do have barn rules that help to keep family, visitors, and barn help safe. We make sure rakes and shovels are put back in the utility room and not left in the barn aisle. We don’t allow the use of extension cords. We make repairs before they cause harm. We take those steps to avoid heartache, we also need to protect ourselves from liability. State equine liability laws help protect farm owners from capricious law suits; a boarder falls off her own horse or is kicked in the pasture. The idea is that some activities, like horse-keeping, carry a measure of risk and all those who engage in the activity accept that risk. But, equine liability laws do nothing to protect owners from negligence. A number of years ago, a Connecticut horse escaped from his paddock in the early hours of the morning. The paddock bordered a major route and the horse ran out into traffic. Tragically, both the horse and the driver of the vehicle were killed instantly. In the ensuing court battle the property owner was found liable. Not only was the fencing in disrepair, but the judge determined the fence type (electric only) wasn’t sturdy enough to ensure the horse would not escape onto the busy road. 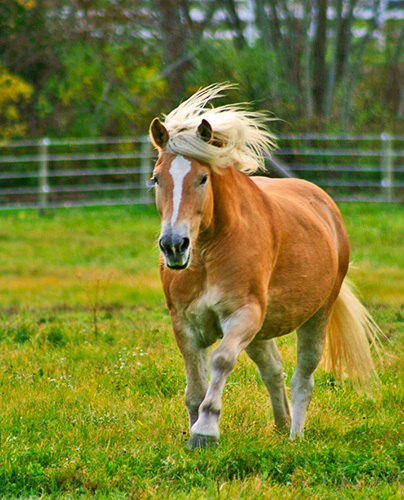 A loose horse that causes property damage or physical harm, is considered negligence in most states. Plaintiffs may sue the farm’s owner, the horse’s legal owner, and even stable operators. As we become more and more urbanized our horses are housed closer to roads and highways and the risk is even higher. 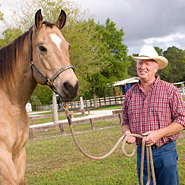 The best defense for loose horse cases is to properly contain the horse in the first place. Good fences keep you and your horses safe. If the Connecticut farm owner had installed a sturdy double fence line along that busy road, a tragedy could have been avoided. • Inspect fencing regularly and make repairs promptly. Don’t use a paddock or field if the fence is in need of repair. • Install gates so that they open in to the field. Lock all gates that are near the road or subject to tampering and fix gates that show gaps between the gate and the fencepost. • Install catch pens in fields so that removing one horse doesn’t lead to a horse escape. A catch pen is a small fenced area just inside the gate (similar to what you find at the dog park). • Consider installing a double fence line. It’s something we associate with fancy Thoroughbred breeding farms, but it’s a worthwhile investment for any farm owner, especially along pastures or paddocks that border a road. If a horse pushes through the interior fence, he’ll still be contained. If a vehicle damages the exterior fence line, chances are they’ll be stopped before reaching the second fence line. • Check your farm insurance policy. Insurance companies often give discounts to farm owners who go above and beyond to minimize risk. Double fence-lines along roadways do more than just contain your horses. That extra line of fencing discourages passersby from feeding or petting your horses, minimizing yet another liability risk; an accidental horse bite. While many of us think of double fencing as being constructed of wood rails, today, there are far better options that offer better security, lower maintenance, and more peace of mind. When planning a double fence line, be sure that the interior fence is highly visible. The interior fence should offer a psychological as well as a physical barrier. To do that it must be at least wither high to deter horses from simply stepping over or jumping the fence. Coated wire fencing is a great choice for an interior fence along a roadway. 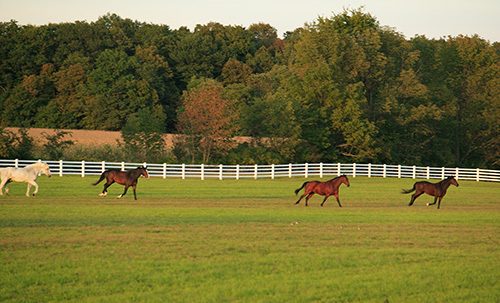 Raceline Flex Fence Coated Wire® and Shockline Flex Fence Electric Coated Wire® are both cost-efficient and safe, flexing on impact to avoid equine injury. A double fence line should be constructed of low maintenance materials so both of these are good choices; they never need to be painted nor do they splinter like traditional board fencing. High Impact Flex Fence® rails are the new standard for many farms, especially along roadways. These rails flex up to six inches on impact making this a perfect choice for an exterior fence line. 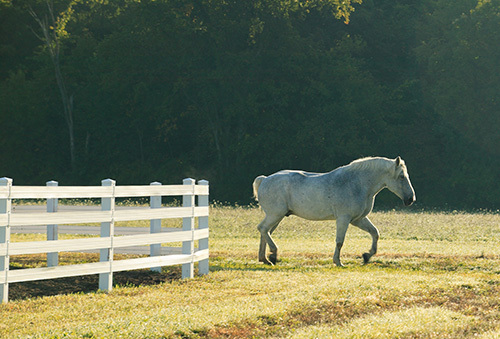 The 5.25” Plus Flex Fence® offers the impressive white or brown board look while keeping your horses far safer than a wood-board fence which could splinter on impact. The colors stay true with built-in mildew resistance and UV inhibitors and revolutionary hardware makes it one of the easiest fences on the market to install. RAMM’s High Impact Flex Fencing® is designed for strength with three 12.5 gauge double-coated high tensile wires mechanically trapped in polyolefin plastic. It’s tough and practically maintenance free. It is, hands down, the safest fence you can buy. It’s important as horse and farm owners to know the liability laws in our state and to take the necessary steps to keep our horses safely contained. Call RAMM to speak to one of our fence planning experts at 800-434-8456, go to rammfence.com or visit us on Facebook. Spring is the perfect time to shore up that fence line!